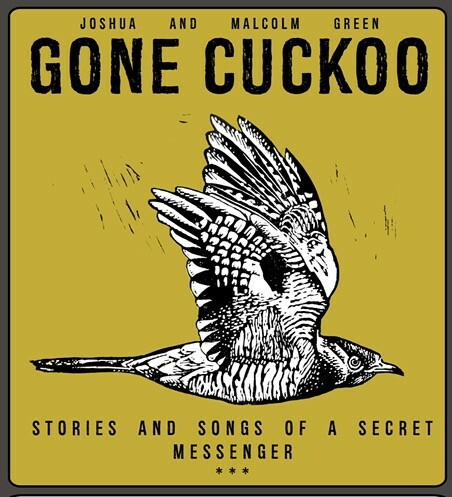 In their new show, storyteller Malcolm Green and musician Joshua Green follow the trail of the Cuckoo to explore the fascinating world of this extraordinary creature through stories, music and song. It’s shortly after dawn at RAF Fyingdales on the North York Moors and a male cuckoo soon to be named Vigilamus is having a 4.5 gm transmitter strapped to his back. A few weeks later he will have flown thousands of miles south, 5kms up in the sky through Libya and Chad to Congo. For thousands of years the cuckoo’s call has been present in songs, poems and stories. Did he bring the spring? Good luck? Bad luck? Was he the trickster that turned the hawk? He certainly fooled the reed warblers and the meadow pipits who fed him as a changeling baby, whilst playing his ventriloquist tricks. But now this bird is disappearing from our land.We may stop hearing the iconic ‘Cuck-oo’. Father and son duo Malcolm Green (Storyteller) and Joshua Green (musician) are collaborating to tell the cuckoo’s tale…..And with a wry trickster smile will take you on a compelling journey, weaving together the rhythms, stories and songs of this extraordinary creature and the lands over which it travels. Join us to discover the secrets of his voyage to bring us the spring. Joshua is percussionist and writer for the widely acclaimed contemporary folk band Sam Lee, which won the album of the year critic’s choice in Songlines magazine for ‘A Fade in Time.’ He is vocalist, percussionist and dancer for The Super Best Friends Club, whose latest album, ‘Love Blows’ has had airtime in BBC Radio 3 and Radio 6 Music. He is an experienced workshop and choir leader.